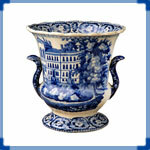 Perhaps one-of-a-kind, this wine cooler shows the Boston State House by Rogers, and the beauty of having the pattern on such a large piece is the detail included in the scene. The handles appear to be Lions' heads. This is version #1 of the three Rogers versions of this scene (see that view in this exhibit under Patterns). All of the Boston State House images in Shapes are of the #1 variety. For the #2 and #3 variety, see Patterns. Boston Common (also known as "the Common") is a central public park in Boston, Massachusetts. It is sometimes erroneously referred to as the "Boston Commons". 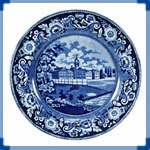 It is part of the scene on pieces whose central image is of the Boston State House. Dating from 1634, it is the oldest city park in the United States. The Boston Common consists of 50 acres of land bounded by Tremont Street,Park Street, Beacon Street, Charles Street, and Boylston Street. The Boston State House, now known as the Massachusetts State House, stands across Beacon Street from the northern edge of the Common.